After a much needed holiday break, our family is getting back into the routine of life. School is back in session, activities have started back up, and I have found myself, like so many others, making resolutions. It's that time of year. Resolutions are the thing to do. :) You might have even made goals for your family. But how many of us sit down AS A FAMILY and make Family Resolutions. What a great way to strengthen our families, make resolutions together! The perfect way to start the year. It is also a key way to teach your children important life skills like setting and achieving goals. following through, working as a team and being accountable, just to name a few. You will want to gather your entire family together to make your resolutions. You want everyone to have input on the decisions. Whenever family members have a say in the decision making process, they are more likely to follow through and support. Once you sit down together, open the discussion by asking your family what you did great in 2012. Talk about all the strengths your family has, and all the good things your family did. Keep the discussion positive and focused on all the good. This will set a tone for the rest of the goal setting. Then, there are a number of different approaches your family can take to make resolutions. A common theme is a good place to start. How do you come up with a theme? Choose a key word you would like to focus on for the year. (service, organization, love). Choose a quote, motto, or saying that represents what your family would like to focus on for the year. Choose a scripture that your family would like to focus on. Choose a weakness that your family would like to make a strength. is there anything you would like to see changed in our family? is there anything you would like to do more of/less of in our family? what are some of our family's weaknesses? Use the thoughts and answers to these questions to help distinguish your resolutions. If you can, write everything down on a large piece of paper or a white board so that everyone can see what is going on and consider the thoughts together. Narrow all the suggestions down to 2-3. Too many choices will be overwhelming. Once you have decided on your resolutions, you will need to establish the details for each one. Each resolution needs a plan of action. How will you accomplish the goal/resolution. How will you measure your success/failure. Remember, this first meeting will set the tone and establish the preliminary resolutions and guidelines. As you go, you will see where you need to make modifications. Before your family resolution meeting is over, decide when you will meet next to talk about your progress. This is a very important part of the process, and teaches your children important life skills like learning to follow through when you set goals. These follow up meetings should be regular. They should be kept positive, and provide an opportunity to evaluate how your family is doing, and if any modifications need to be made. You will find that setting family resolutions is not only fun, but it will bring your family closer together. And isn't family closeness a resolution we have every year? :) Don't just set resolutions for yourself this year. 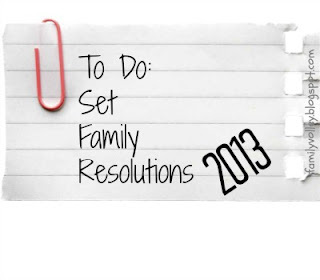 Create resolutions for your family also and you will see 2013 be your families best year EVER! Throughout the rest of the week we will talk about three key resolutions that every family should implement this year. Stay tuned. What was one of your families strengths in 2012? If there is one thing you would like your family to work on this year, what would it be? Have you made any family resolutions? Happy New Year, Heather! Thanks for the wonderful idea and method to family resolutions. Hi Suzanne, Thanks for saying hello. I hope you and your family had a wonderful holiday season and New Year! Hi Hi! It always makes my day to hear what you have to say. Let's keep this conversation going. Thank you for your comments. Don't want to leave a comment here, email me at blog.familyvolley@gmail.com. Homemaker, wife and mother. My husband and I have six children. On the side I am an adjunct faculty member at Brigham Young University and a marriage and relationship coach. I used to speak French, wish I could dance, and will almost always choose fruity over chocolate.